Calculate the surface area of a structure. 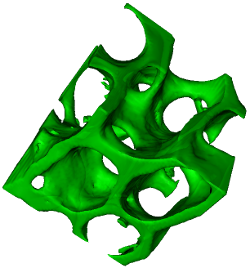 Isosurface constructs a triangular surface mesh by marching cubes and calculates the bone surface area (BS) as the sum of the areas of the triangles making up the mesh. The surface mesh can optionally be displayed in a 3D Viewer window. Lorensen WE, Cline HE (1987) Marching cubes: A high resolution 3D surface construction algorithm. In Proceedings of the 14th annual conference on Computer graphics and interactive techniques, 163-169. doi:10.1145/37401.37422. Resampling: how much resampling to apply to the stack while creating the surface mesh. A low number results in an accurate but jagged mesh with many triangles, while a high number results in a smooth mesh with fewer triangles. Save as binary STL: writes STL of mesh triangles directly to disk. If 'Show surface' is unchecked the mesh is not displayed - this can be useful for large meshes. This file last modified 1008hrs 04 February 2016 © Michael Doube 2004-2019 :: Designed to be interoperable and standards-compliant.